Apartment Bianca is a two bedroom apartment with two bathrooms situated just a 10 minute walk from the beach and marina in Los Gigantes. 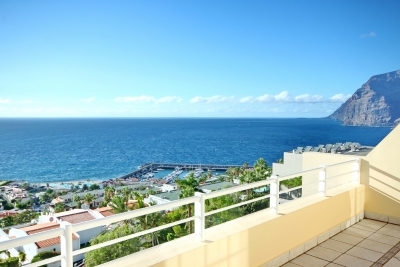 The apartment is built over 2 levels and has 2 balconies, both of which enjoy stunning sea views, as well as the famous cliffs. The apartment is on a complex with a shared pool and plenty of sun loungers. Downstairs there is a spacious lounge with a flatscreen TV with satellite channels, including English. There is also a dining table and chairs and an open plan, fully equipped kitchen, which includes an oven, hob and microwave. Patio doors open out to the downstairs balcony which has sun loungers. The second bedroom is also downstairs which has 2 single beds and wardrobes and a family bathroom. The master bedroom is upstairs with a double bed. There is an ensuite bathroom and patio doors leading out to the upstairs balcony. The apartment also has wifi internet access and air conditioning. Generally the check-in could be after 2:00 PM and the check-out by 10:00 AM, unless there is no other guest leaving / arriving on the same day. In case of check-in after 21:00 there is an extra pay of 20 euro and if it's after 23:00 then it's 30 euro extra for late check-in. Also please note that for check-in and check-out on non-business days (Sundays in particular) the local contact will charge an extra 30 euro (only for those non-business days). with oven, hob, microwave etc. A deposit is required to secure the booking and the balance of the booking fee is payable directly to the owner on arrival. The owner also requires a security bond of 100 euros, which is refunded back to clients before departure, providing there are no breakages in the apartment.